Now that you have Windows 7 installed on your PC, you may have noticed that there are many new fonts in the Control Panel > Fonts window. According to Microsoft, there are over 40 new fonts included with Windows 7. Many of the fonts simply allow Windows to support additional languages and writing systems. You can see the full list of fonts included with Windows 7 at the Microsoft Typography site. However, those new fonts can make finding your regularly used fonts on formatting menus more difficult. 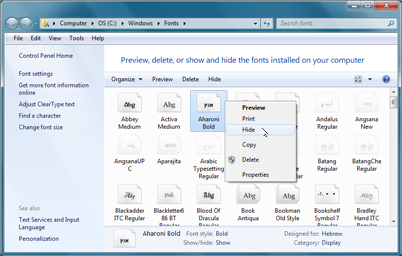 In this article, I will show you why the new Windows 7 Hide Fonts option is not a sufficient solution for taming the font menu. Microsoft is aware of the fact that with additional fonts comes additional complexity. All of the foreign language fonts do make it hard to locate Goudy Old Style when it is buried in with Gisha, Gulim, GulimChe and Gungsuh. To help alleviate this, Windows 7 has a new Hide option for fonts. In theory, hidden fonts will not appear in font dialogs in other applications. 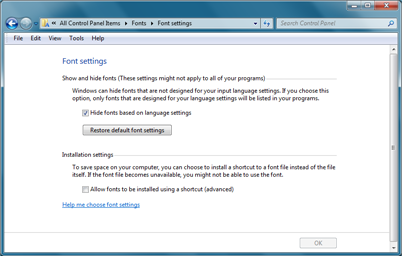 On a fresh Windows 7 installation, a selection of fonts will automatically be hidden based on the settings found in the Region and Language Control Panel. You can also hide individual fonts. Navigate to the Windows Control Panel. Double click the Fonts icon. 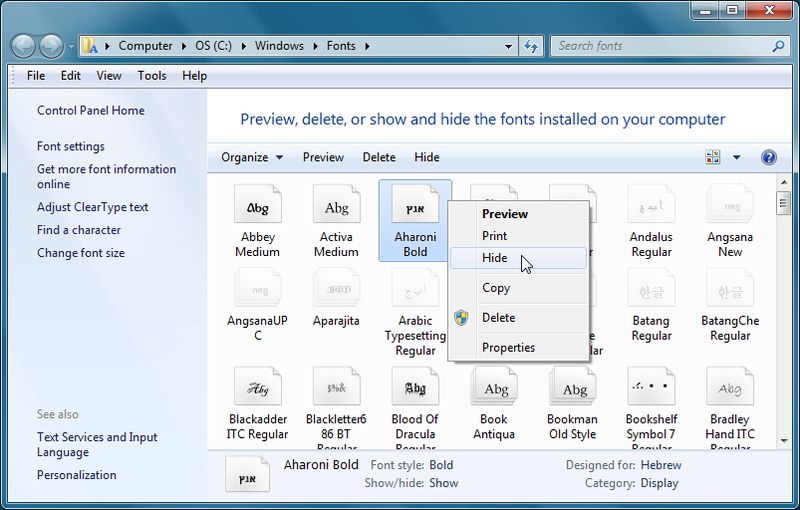 In the Fonts window, right click a font and select Hide from the context menu. The icon will dim a bit to indicate that it is hidden. You can un-hide a font by right clicking a hidden font and selecting Show from the context menu. And if you click the Font settings link on the left side of the Font window, you will expose the window Font Settings. There are options here to enable or disable the Font Hide feature and to reset the hidden flag on all fonts based on your keyboard language setting. 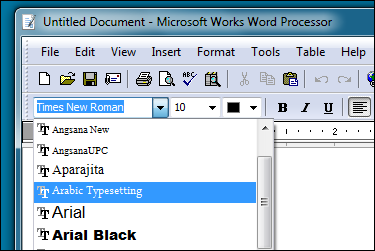 According to Microsoft documentation, the Hide fonts function will remove a typeface from application font menus. The font will still be available for drawing text, it just hidden from the menus. This will work for many, but not all, applications. Applications that use the the Choose Font dialog or the new Scenic Ribbon controls will properly hide fonts. Applications that provide their own font toolbars or menus won't hide fonts unless they are upgraded. The screen shot below is from the copy of Microsoft Works 9.0 that shipped with my Windows 7 laptop. Note the font Arabic Typesetting that appears in the dropdown. I have this font Hidden in the Control Panel. So even if you have fonts hidden based on your locale, Windows applications that provide their own font selection user interface will not take the settings into account. This was surely done for backwards compatability. "In Windows 7, there are no APIs for directly querying which fonts are hidden, or for setting fonts to be hidden." How applications determine if a font is hidden, as of the writing, remains unknown. The answer likely lies in the Registry and it is just a matter of time before information about it is published.